Amy's Kitchen has long been the dominant manufacturer of gluten-free frozen meals, but its reign may soon be challenged by Evol Foods. Having just been acquired by Udi's and Glutino owner Boulder Brands, Evol is poised to expand its reach and product line throughout the United States. 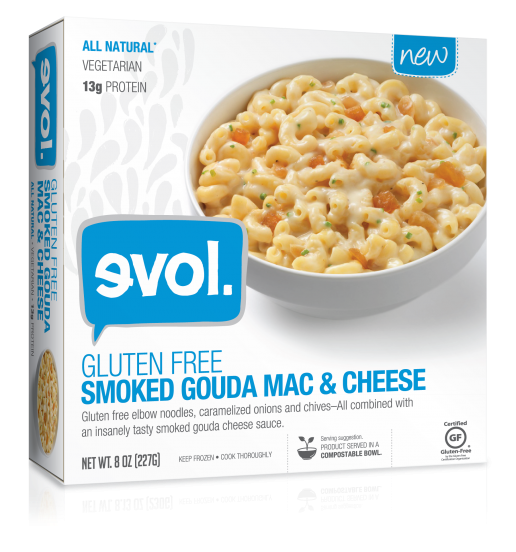 In fact, Evol's roster of all-natural gluten-free items, which currently includes burritos and quesadillas, has just grown with new microwaveable meals, including two savory mac-and-cheese entrees. 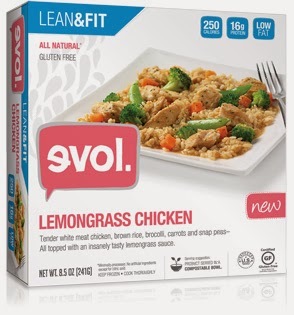 Included in Evol's new Lean & Fit line - dishes under 300 calories and high in protein and fiber - are Lemongrass Chicken and new-look Teriyaki Chicken, both made with white meat and brown rice. Another new product is Indian staple Chicken Tikka Masala, available as a bowl and as a "for two" meal that's ready in 10 minutes. The Teriyaki Chicken and new Thai Style Curry Chicken are also sold in family-style portions. Microwaveable gluten-free macaroni-and-cheese meals round out the additions: Smoked Gouda Mac & Cheese (which is vegetarian) and Uncured Bacon Mac & Cheese. Both are made with gluten-free brown rice pasta. Evol's products are sold at Target, Whole Foods and other area markets and natural-food stores.